With hundreds of thousands in use worldwide since it was introduced in 2002, Dry & Store Global has established itself as the most effective and most popular electrical hearing instrument care appliance on the market. The recently redesigned Dry & Store Global II, with its sleek modern design, takes that tradition to a new level. Easy on the eyes, and easy to operate. Fully automatic, microprocessor-controlled circuitry shuts off after 8 hours (or when the lid is opened). Highly-effective germicidal cycle has the same powerful germ-killing abilities, but with a shorter cycle at only 90 seconds, and greater reliability over the long term. Quiet fan gently circulates warm, dry, temperature-controlled air around the hearing instrument, causing damaging moisture to retreat from inside the instrument to the circulating air. Powerful Dry-Brik II desiccant is like a magnet to the moisture that is released, ensuring that the moisture is gone for good. Universal switching power supply (100-240V @ 50-60 Hz) accommodates electrical service around the world. No voltage converter necessary. Can also be used with an inverter for 12V service. ( WILL REQUIRE PLUGS FOR VARIOUS COUNTRIES). 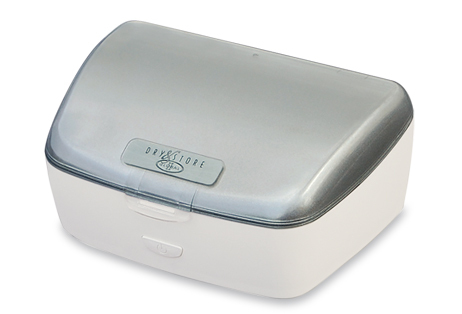 Generous drying compartment (2-7/8” x 3-7/8” x 1”) easily accommodates two BTE hearing aids or processors (including implant equipment), or a single body-worn processor. At 7.2" x 4.9" x 3.3" and only 2.2 lbs, Dry & Store Global II can go with you, ready to care for valuable hearing devices and, if needed, an iPod too!